I love walking. In the countryside, along the coast, around towns. Anywhere really. Of course, it helps if the sun’s shining. Or at least if it’s not raining. Since bringing Barney, our cocker spaniel into the family, I’m walking more than ever. That’s great. But the downside is that I have to take him out in all weathers. And walk through a lot of muddy puddles. And as a result I’ve discovered that a lot of my shoes let in a lot of water. Step in some wonderful waterproof socks. 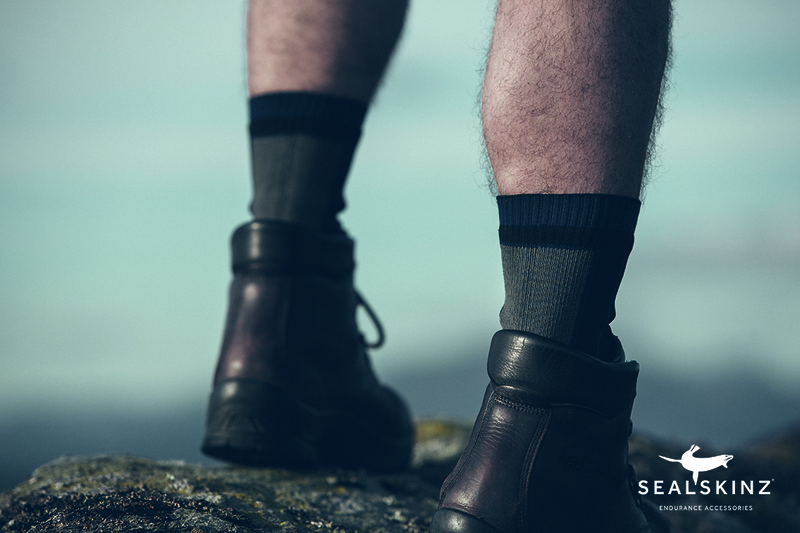 I first got hold of a pair of Sock Shop’s Sealkinz Waterproof Socks when my eldest son headed off to the Brecon Beacons for some wild camping as part of his Gold Duke of Edinburgh Award last month. Every other expedition he’s been on, he’s come back with blisters and wet socks. So I figured some heavy-duty help was needed. The socks kept him dry through not only rain, but mountain sleet and snow too. And no blisters. So, needless to say, they’re more than a match for a walk in the woods with your dog. Which is why for the moment, they’re in my sock drawer thank you very much. We’ve got together with the fantastic Sock Shop to offer you the chance to win a pair of unisex Sealskinz 100% waterproof mid-length walking socks worth £30.99. they’ll be your feet’s best friend – in all weathers! 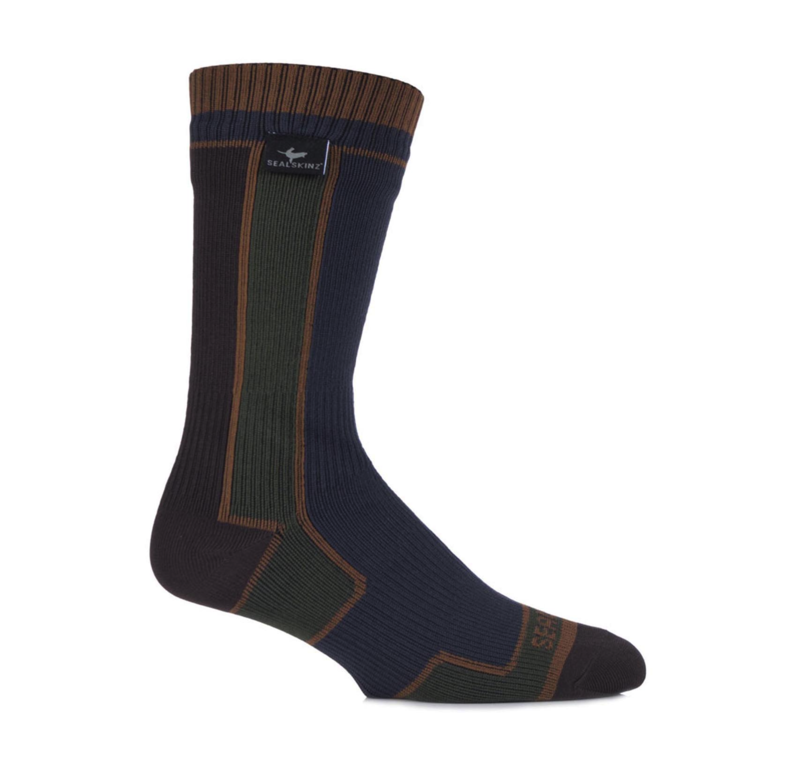 These thin, low weight mid-length socks will be your feet’s best friends in any outdoor, wet weather activity. Camping, trekking, or just walking the dog. Waterproof and windproof, they’re designed and made in the UK to Sealskinz ADD (Aqua Dynamic Design) principles with a patented Stretchdry technology – resulting in a flexible, close fitting sock with a comfortable merino wool lining, ribbed leg with elasticated cuffs, ankles and insteps for a supportive, comfortable fit, with blister-resistant hand linked toes for smooth seams. *SUBSCRIBE to my blog via email (you’ll see the ‘subscribe’ button to the right or bottom of this page, depending on what device you’re viewing it on). Then, leave a comment under this post on what you like about Sock Shop and its socks, or let us know why you’d like to win a pair and where you’d wear them! *IF YOU ARE ALREADY A SUBSCRIBER : simply leave a comment under this post on what you like about Sock Shop and its socks, or let us know why you’d like to win a pair and where you’d wear them! Closing date: Wednesday 25th May 2016. Delivery to UK addresses only. Your comment that the legs in the photo aren’t yours made me smile, Kim! I would be proud to have such shapely legs, give or take a little depilation, of course! I am a fan of socks and of the Sock Shop. They sell much more than any old sock and I am pleased to see that they stock unisex socks, too. I would much prefer to see more clothes and accessories sold as unisex. These would be great for when we go on long walks in the Lake District. Sock Shop have such a good range of socks – something for everyone. Perfect for my husband who cycles to work every day – rain, snow, sun, storms, hail – he has done it all ! Nice! Like you, I walk the dog a fair bit. In all weather. These would be great! How have I managed so long without these ? I like Sock Shop because it provides accessibility to socks such as Sealskinz. Also because I spend a lot of time outside, and appreciate the outdoors type clothings, especially waterproof. Sealskinz waterproof socks appear great. Maybe if I could afford I would buy lots of Sealskinz waterproof and windproof socks. I need some good socks for work, these look ideal. I absolutely adore new socks and love walking so a shop of wonderful socks is just my cup of tea and socks for walking are even better! Whatever kind of socks I’m looking for I can find them at Sock Shop. The socks shown here would be ideal for all my treks in the perpetually soggy Scottish Southern Uplands. I do multi eventing,tri-athalon, cross country. these socks would be put to good use,its gets muddy and wet,going through puddles ,ditches. I love sock shop, I love the different styles and there so funky! As a farmer who hasnt found a pair of boots that stay waterproof for more than 2 months these would be a great prize! These would be amazing for my hubby, he hates getting his feet wet while fishing/ walkin/ roofing, especially during winter! I love the fashion forward socks like the image used for knee high socks on the front page ! I have damaged the gore text in my trainers and these socks would stop me getting wet feet, please? Ideal when I go climbing the rocks! To allow my feet freely and relaxed to proceed!! I’d love these for festivals! Great products. Wonderful selection. I adore socks and get exited to what designs I receive at Christmas. I like that they have nice patterns! We do a lot of walking on the yearly trip to Iceland. I love that I can buy socks to best suit any activity and conditions. sorry for forgot to also state I would like these socks to protect my feet when I go on my fishing trips. this is really useful idea! got soaking wet feet before!! What a great idea so we can still get out and about in all weathers! 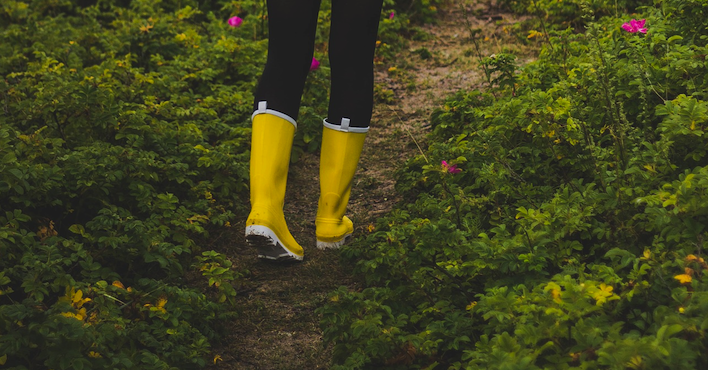 We always go on rainy walks, so feet always wet never owned a pair of these, it would be great too. My teenage son’s socks practically walked through the door by themselves when he came back from his practice D of E hike. These are the best socks to keep your feet dry and warm. I would love to have a pair. I love the variety the colour and the exuberance of them. Perfect for wearing when I go fishing with my husband! I would love the sealskin socks. Perfect for cycling. I never realised there was such a thing as waterproof socks! What an amazing idea! I would love to win these to try them out and see how well they actually work! I’m about to go live on a tiny wet Scottish island for a month and I would love these to keep my toes warm and dry! Love the range. I didn’t know Sock Shop sold these or that they existed. These socks would be perfect for wearing with my riding boots and yard boots. Thanks for the opportunity. I would love to win these socks for my daughter who is a keen member of The Ramblers. Her present boots are old and the leather has cracked in places so these would be amazing while she saves up for replacement boots! I would love these socks for those cold wet days of summer and winter that we always seem to get and still have to take the dog out for a walk! I love the variety of different styles, sizes, materials and colours they have. I’d love to win as these socks could keep my feet dry no matter where I roam. They look great quality – we get through socks so quickly here! I too enjoy walking, no dog though and these would be brilliant for those puddles I can’t avoid and traffic seemingly throwing the puddle water at me. I would love to try a pair. I would wear them for the days when I work at an inner city farm. After it has rained, the horses get muddy (they seem to love rolling in mud! ), then they have to be washed and even though I wear wellies & waterproof trousers, water often gets into my boots and makes my feet wet. Spending the rest of the day with cold wet feet is no fun, so it would be nice to have socks that keep my feet dry. hubby works 80hrs per week in winter and this would be amazing for him.